Banana Shire is situated in Central Queensland, Australia. It is 120 km west of the growing industrial city and port of Gladstone and an easy drive to the city of Rockhampton. It has rail and road links to both of these cities and is serviced by the Leichhardt, Dawson and Burnett Highways. Direct flights to the Shire from Brisbane arrive at Thangool Aerodrome. Steeped in agricultural and mining heritage, this resource-rich area was named in the 19th century after a dun coloured bullock called Banana. Coal mining, beef production, power generation, dryland cropping and irrigation cropping such as lucerne and cotton are the Shire's major industries. A variety of soil types suitable for the production of a wide range of crops, together with some of the best grazing, farming and irrigation land in the State, give the Shire enormous agricultural potential, with further potential for processing and value-adding. 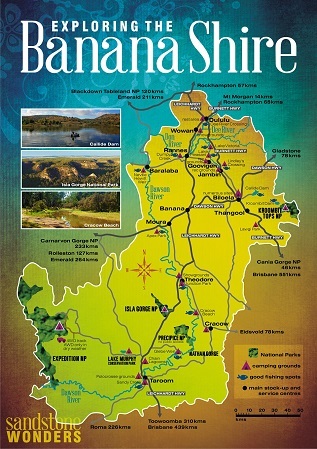 The Banana Shire is rich in natural resources with extensive undeveloped coal deposits in the Theodore, Moura and Baralaba area. There are abundant supplies of coalbed methane gas, which is utilised for power production and other industrial uses. The Shire is currently the focus for development of LNG (Liquified Natural Gas) pipelines running from the Surat and Bowen Basins through to Gladstone. The Banana Shire has become the largest commodity producer in the Fitzroy Statistical Area, contributing $123 million dollars to the State's economy in 1998 from rural industries alone. The Biloela meatworks is the third largest in Queensland and processes meat for export throughout Australasia. The Callide power stations produce about 20% of the States electricity. The Banana Shire is sparsely populated, with its population of approx. 15,742 people spread over 28,577 square kilometres, of which only 27 square kilometres is urbanised. The main population centre is the town of Biloela, with Moura and Taroom being other significant urban centres in the Shire. Banana, Baralaba, Dululu, Goovigen, Jambin, Thangool, Theodore, Wowan and Cracow comprise the remaining towns of the Shire. The town of Biloela (pop. 5371) is the main population and administration centre in the Shire and the dormitory town for 3 Callide power stations, Callide Coal Mine and Teys Meatworks and is the service centre for the Callide Valley. Moura (pop. 1774) and Taroom (pop. 629) are two of the larger urban centres in the Dawson Valley. Moura has the second largest wheat dump in Queensland and is the location for the Queensland Cotton Gin, Queensland Ammonium Nitrate Plant and Moura Coal Mine. Taroom is richly endowed with natural attractions, a thriving rural sector and a wide range of quality community and business facilities. The town is well known historically for the Leichhardt Tree. Situated in the main street, this tree bore the initials of explorer, Ludwig Leichhardt, as he travelled through the district in the mid 1840s. Theodore supports a diverse rural sector with its main industry being cotton. Almost 80 percent of the Shire's cotton is grown in the Dawson Valley Area. Other townships are Banana, Goovigen, Jambin, Wowan, Dululu, Cracow, and Thangool all of which have their own individual characteristics and attractions. The Shire supports numerous industries and basic services. These include numerous child care facilities, eleven public primary schools, three private primary schools, two high schools, 3 prep to year 10, one TAFE, most churches and their associated groups, five public hospitals, and most business and popular sports. Biloela has an excellent PCYC complex. Banana Shire provides a variety of recreation, employment, education and lifestyle options. Sport and recreation play a major role in the lifestyle of Banana Shire residents with over 470 community and sporting groups to choose from. The Shire has many natural attractions including gorges, rivers and National Parks such as the Glebe Weir and Expedition National Park, Lake Murphy, Kroombit Tops and Mt. Scoria Conservation Parks, and Isla and Cania Gorges. The Dawson River and Callide Dam provide opportunities for fishing and water sports. The Shire can also provide many adventures for the 4WD enthusiast. For those with an interest, many towns in the Shire have a rich history which has been well documented photographically and otherwise in historical villages and museums. If you would like to discover all the things to do in the Banana Shire during your holiday, make sure you head over to the Banana Shire Tourism Website. You will find all the best camping spots in the Banana Shire, the top fishing spots and self drive itineraries through our national parks and towns! Banana Shire is progressive with many opportunities in Industry, Business and Tourism. The Nathan Dam Project: The Queensland Government is currently completing the Environmental Impact Study for the construction of the Nathan Dam on the Dawson River to commence in 2012. This project will see the Dawson Valley and the Banana Shire become the next major development area in Queensland. Surat Basin Inland Rail Project has been declared a significant project by the State Government in December 2007.